On this France river cruise vacation, enjoy wine, cheese, history lectures hold by an expert travelling with you, beautiful views, and stops in the most charming and historical parts of France. 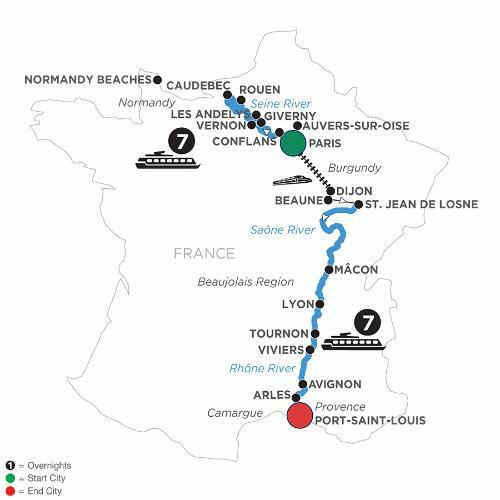 Sail along the Seine River to the picturesque Normandy region. In Vernon, choose between two exciting guided visits—Claude Monet’s stunning gardens at Giverny or the remarkable Bizy Castle, known as “Normandy’s Versailles.” Go on an excursion to the historic Normandy Landing Beaches, including Omaha Beach, the Point du Hoc monument, and the American Cemetery. In Rouen, go on a guided walk through the medieval quarter, visit the gothic Rouen Cathedral and learn the important role played by this city during the French Resistance. Alternatively visit the battlefields in the area of Vimy Ridge and Beaumont-Hamel. Before you depart the beautiful Seine River, spend time in Paris—one of the world’s most romantic cities! The “City of Light” has Notre Dame Cathedral, the Eiffel Tower, and the Louvre Museum. Delight in a guided walk through the historic Île St. Louis or take a tour focused on WWII and visit the Museum of Les Invalides. Lyon, sitting at the confluence of the Saône and Rhône Rivers, is France’s third-largest city and a showcase of medieval and Renaissance architecture. The city of Tournon is beautifully nestled among vineyards. You’ll go on a guided walk of this medieval treasure with plenty of Roman ruins and a fascinating 16th-century castle. In historical Avignon, see the 14th-century Palace of the Popes—the largest gothic fortress in the world. Situated on the Rhône River, Arles is famous for inspiring the paintings of Van Gogh and its 1st-century Roman Amphitheater, which hosts plays and concerts to this day.